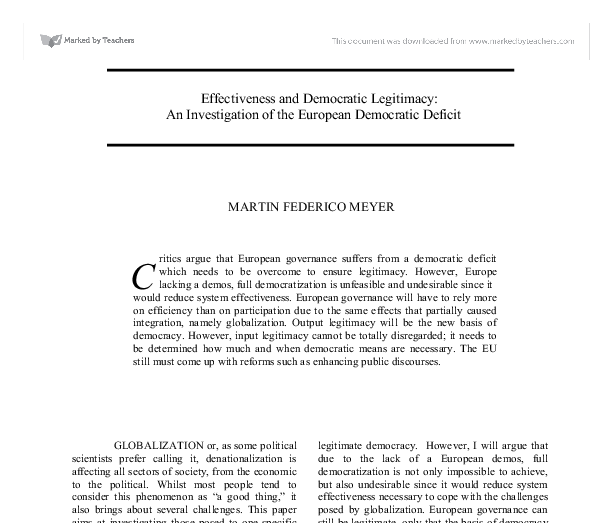 MARTIN FEDERICO MEYER ritics argue that European governance suffers from a democratic deficit which needs to be overcome to ensure legitimacy. However, Europe lacking a demos, full democratization is unfeasible and undesirable since it would reduce system effectiveness. European governance will have to rely more on efficiency than on participation due to the same effects that partially caused integration, namely globalization. Output legitimacy will be the new basis of democracy. However, input legitimacy cannot be totally disregarded; it needs to be determined how much and when democratic means are necessary. The EU still must come up with reforms such as enhancing public discourses. GLOBALIZATION or, as some political scientists prefer calling it, denationalization is affecting all sectors of society, from the economic to the political. Whilst most people tend to consider this phenomenon as "a good thing," it also brings about several challenges. 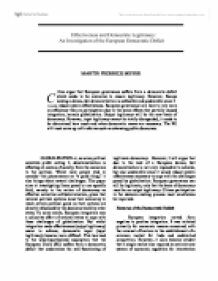 This paper aims at investigating those posed to one specific field, namely to the notion of democracy as effective collective self-determination, given that national political systems loose their autonomy to reach certain political goals as their options are directly influenced by the decisions taken by other states. To some extent, European integration was a collective effort of national states to cope with these challenges of globalization. But whilst integration made effectiveness (output legitimacy) easier to achieve, democratic input (input legitimacy) became more difficult. This has lead to the wide-hypothesized assumption that the European Union (EU) suffers from a democratic deficit that undermines the well-functioning of legitimate democracy. However, I will argue that due to the lack of a European demos, full democratization is not only impossible to achieve, but also undesirable since it would reduce system effectiveness necessary to cope with the challenges posed by globalization. ...read more. A New Form of Democracy The lack of a European demos mentioned above should have made clear that full-fledged input legitimacy is unrealistic at the European level. But whilst the EU will increase input problems, at the same time it will decrease problems of output. Effectiveness will have to come at a democratic cost. This is very much in line with the democratic dilemma pointed out by Dahl - system effectiveness beyond the nation-sate runs counter to citizen participation. But Dahl also argues that we are witnessing a third transformation of democracy from territorial states to multi-level systems. The implication is that just as democracy on the scale of national states required new patterns of political institutions radically different from those of the small scale city-states, democracy on a transnational scale will similarly require new sets of institutions sometimes radically different from those of the familiar political institutions in modern representative democracies. (Dahl, 1994, 27) Dahl's argument appears inherently convincing and could help explain why filling the democratic gap with elements found at the national level is a wrong approach. Since the European Union is not a state, its institutions ought not to be assessed on the basis of those found in the member states. Merely transferring those institutions from the national to the European level would not make the EU more democratic or legitimate. One should rather look if a new form of democracy could come to exist and how this form of democracy could operate differently from that within the nation-states. As the notion of input legitimacy is under direct constrain from external economic and institutional factors, this new form of democracy would inevitably have to depend on output legitimacy. ...read more. Many would question how such a deliberative system could function since a European public sphere is partly missing. However, several authors have commented that creation of a public sphere is not an intangible idea, for instance, due to the emergence of "new European audio-visual spaces - newspapers, television, internet, and English maybe as a bound to be first language - and the new social movements, NGOs and identity politics across borders." (Eriksen, 2000, 55) Especially the Internet provides several possibilities since network media might facilitate community-building and mobilization for civic engagement, and electronic discussion fora could help develop and clarify arguments. Conclusion The democratic deficit in the European Union is not a mere postulation, it is indeed present. However, I have argued that since Europe is characterized by the absence of a demos, "filling" this gap completely would be impossible and also undesirable. But the democratic deficit should not be seen as the end of the legitimacy of European governance. A new form of democracy must come to be understood, one deriving its legitimacy primarily from efficiency rather than from democratic participation. This will be intrinsically significant for dealing with the several challenges posed by globalization. Nonetheless, if the European Union does not want to completely alienate itself from the 360 million citizens it governs, some degree of public participation must be ensured. I have argued that enhancing public discourse is the most plausible solution. This proposal would not intend to completely reform the European institutions, but make European policy more transparent and relevant to the citizenry, and incorporate it in the decision-making process. If this can be achieved, European governance could then for the first time truly be considered effective and legitimate. ...read more. Nugent (1999, p385) points out that policy-making is messy and in contrast to state legislatures, problems are not identified and alternatives not explored. He asserted three models of decision-making. The first is the political interests model, which explores the way that bargaining and compromise is brought about. as in the elections of 2004 the majority of people in the EU didn't vote, the turnout hit an all time low of 45.5%. The situation is worse in the UK, in 1999 only 25% of the electorate voted in the European Parliament elections. Newer members which their economy is not strong compare to Britain's economy, may want to come and work in UK. This will create a lot of competition putting in a great risk UK jobs, as the best one's will be recruited from the UK businesses. thousands of self-directing or non-governmental institutions and ways of life. "7 From Keane's definition, civil society is therefore the realm of independent groups of people advocating different interests and beliefs outside of state institutions. Civil society can be described as an intermediary stratum between the state and the individual. that citizenship reinforces and renders more tangible the individual's sentiment of belonging to the Union; and b. that citizenship confers on the individual citizen rights which tie him to the Union. Something was going amiss in the public relations of the Union. Thus bring the union at a cross road, while those that believe in the vertical integration of the union have praised the constitution as a step in the right direction and want it adopted as it is, the horizontalist sees it unacceptable and unworkable ideas. Even today hundreds of people migrate to America from their homeland to live in the religiously free society of America. Only in America are so many cults allowed to remain and thrive without government interference. The debate over religious freedom is extremely fierce in Europe. And has been for centuries.